I am a doctoral student conducting an online study on healthcare provided for the LGBTQ community with the goal of improving services for our community. The purpose of this study is to better understand the experiences and health of LGBTQ individuals as well as the quality of services received by the LGBTQ community. I hope to use the results from this study for the purposes of better understand how clinicians and social service agencies can better support the LGBTQ community. I would like to request your participation in this online survey and help with this cause. 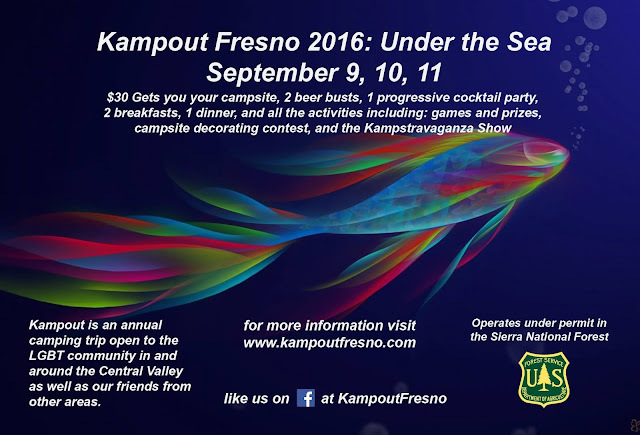 To participate, you must be 18 years or older, and your participation would be voluntary and confidential. I would greatly appreciate your help on this project! In appreciation for your participation, you are welcome to enter a raffle for one of 15 $10, 10 $20, or 3 $50 online gift cards. The survey will take approximately 30 minutes to complete. The study has been approved by the Boston College Institutional Review Board and is supervised by Dr. Paul Poteat. 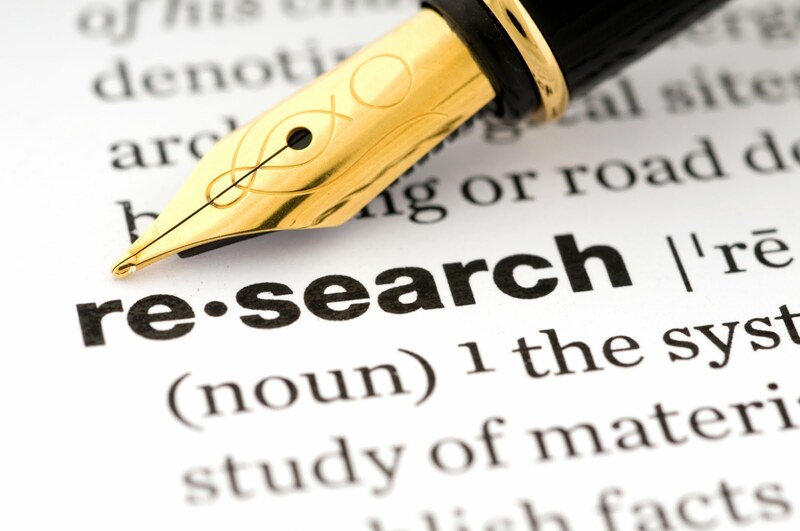 For those interested, I can provide a free online research editorial outlining major findings from the study as well as future research directions. Please feel free to pass this announcement on to other people who might be interested in participating. 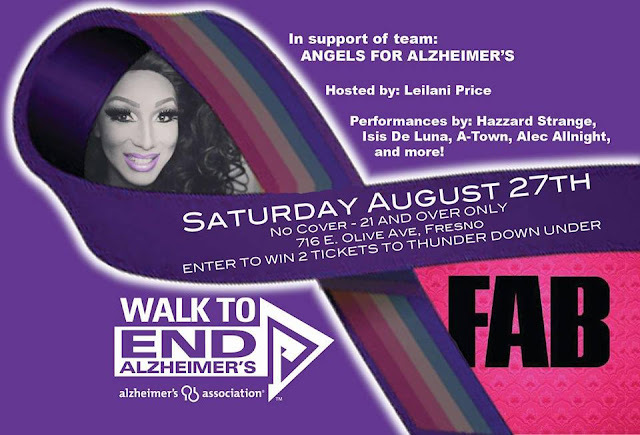 Come help support an amazing cause to help end Alzheimer! My family's team, Angels for Alzheimer are so close to reaching our goal of $5,000 but we need your help. 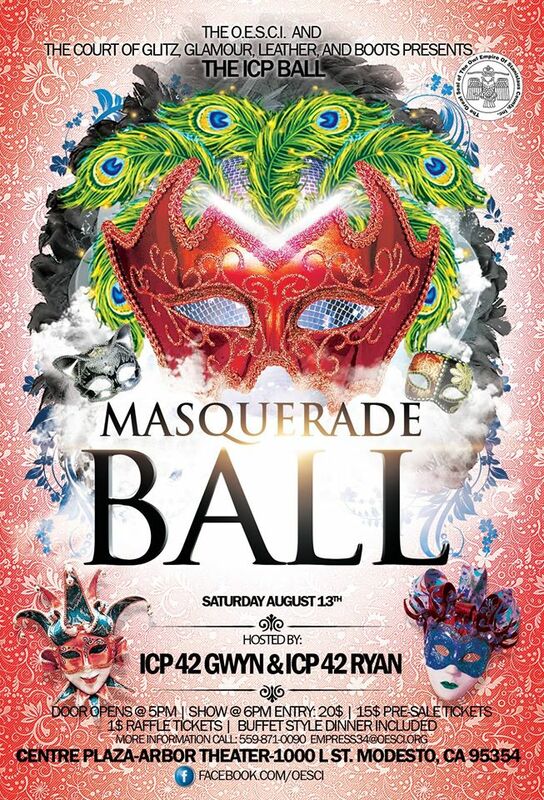 Celebrate 20 Years With CFJ! Thank you to the thousands of supporters, youth, families, and staff who have made the last 20 years so impactful. 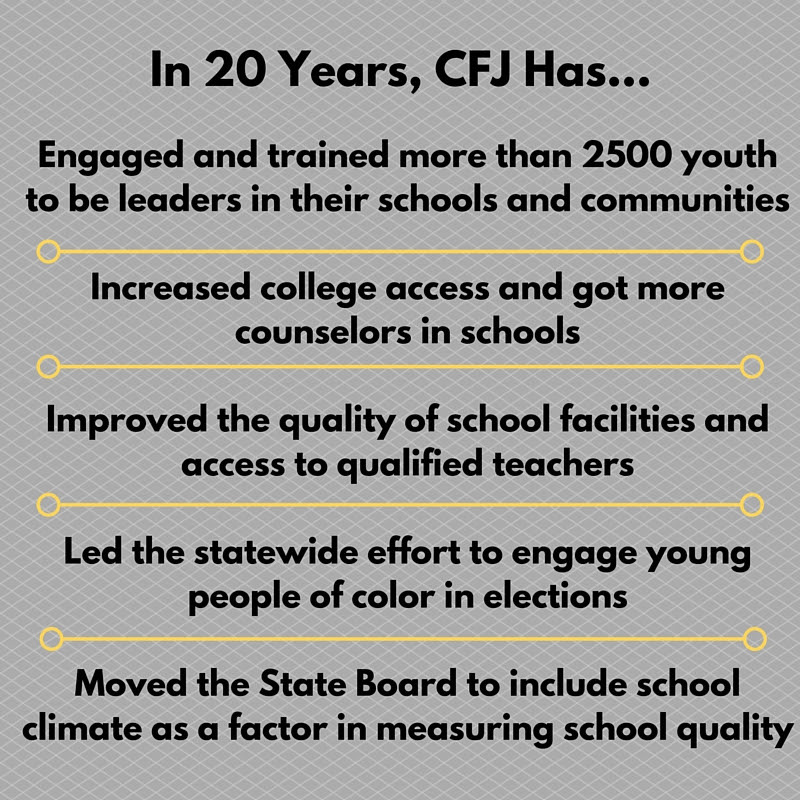 We have much to celebrate and hope you will join us, current, and new CFJ supporters to celebrate our history and learn more about where we're headed in the next 20 years. 20 years of youth power! Join LGBTQ+ programs and services for an informal gathering, and an opportunity to explore our space and meet new people! We invite all LGBTQ+ folks at Fresno State (students, staff, faculty, & administrators) and their allies. 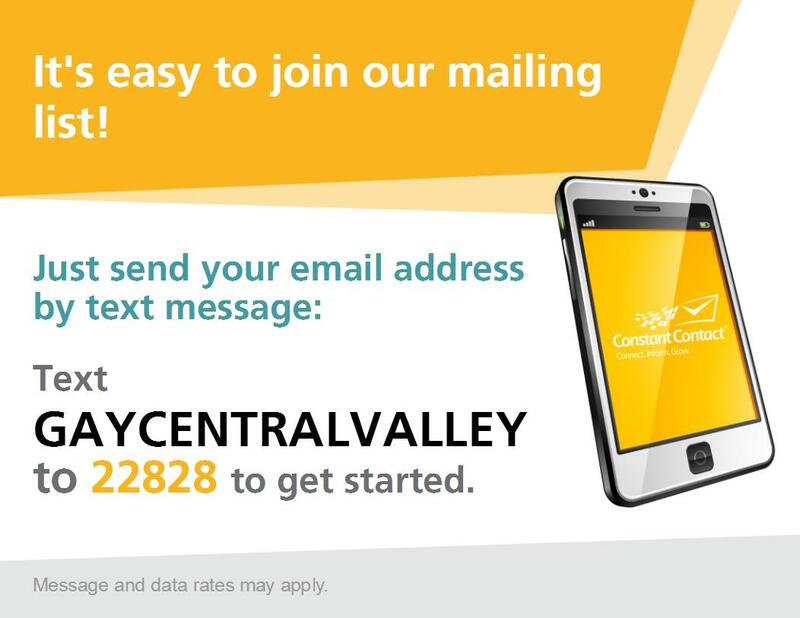 Learn more about upcoming events, ways you can be involved in our program, and how we can assist you and/or your group throughout the year. Light refreshments will be provided. 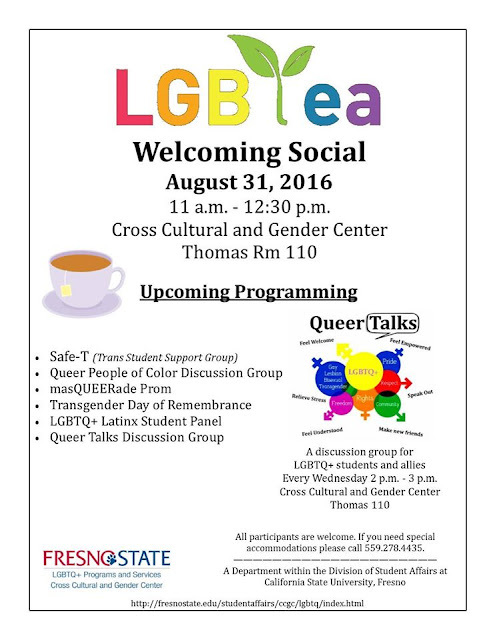 Please contact ccgclgbtq@csufresno.edu with any questions. 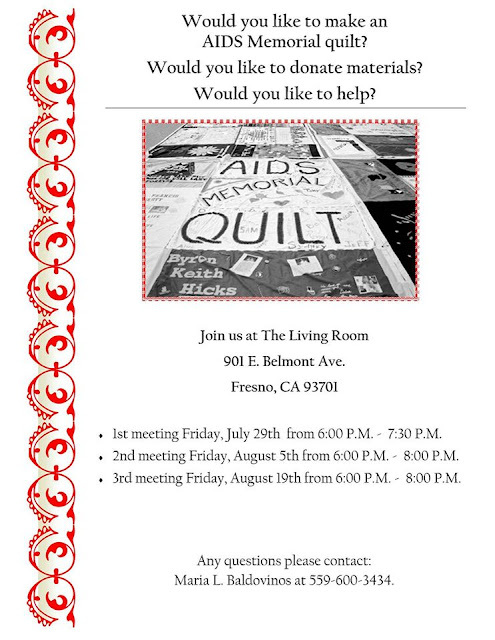 The Imperial Dove Court is the oldest LGBT non profit 501(c)(3) charity of Fresno. This pageant is a fundraising event to raise awareness and money for our local charities in Fresno, Madera, Tulare, Kings and Kern Counties. Anyone within these counties is elegible to compete in this pageant. 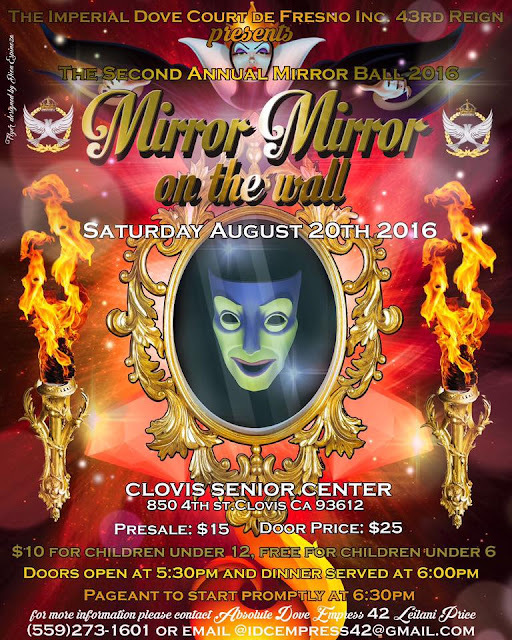 The concept was introduced by HMIM Empress XLII Leilani Price and involves Community Outreach, Fundraising, and Pageantry. Can-Shaking (fundraising): 1 point per every $100 raised. Applications are Now Available. Please contact Emily Gilpin, Alec Allnight or Leilani Price for more information. The Application Deadline is Monday, August 1st, 2016 by 7:00pm at the Imperial Dove Court Monthly Meeting. 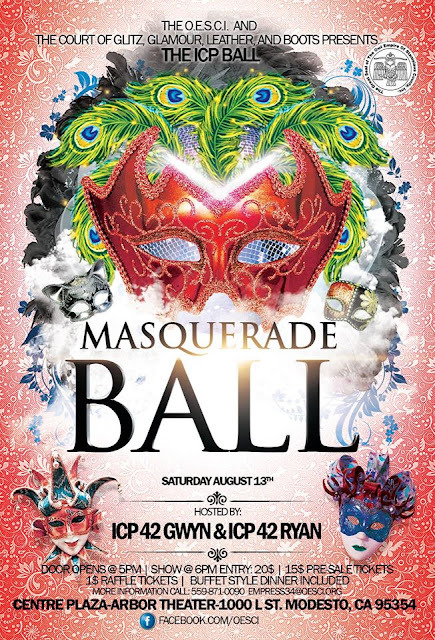 The Imperial Dove Court thanks you for your participation and support of the LGBT community and looks forward to your attendance for our 2nd Annual MirrorBall. 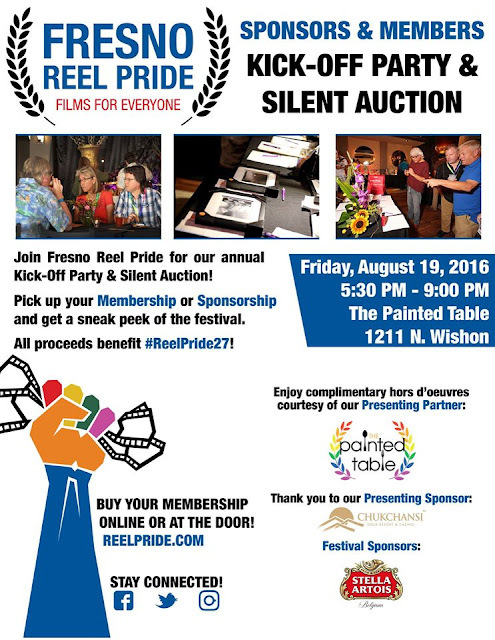 With #ReelPride27 right around the corner, it’s time to get the festivities rolling at our annual Kick-Off Party and Silent Auction being held Friday, August 19, 2016 at The Painted Table, 1211 N. Wishon Avenue in the Tower District, beginning at 5:30 p.m.
Join us and purchase or pick-up your membership passes while enjoying what our Silent Auction sponsors have to offer and the delicious tastings from our longtime Festival Partner, The Painted Table. 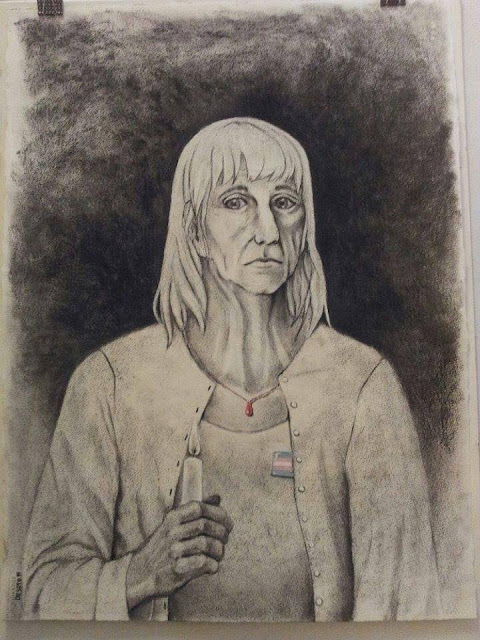 It has been one year since the tragic hate crime that resulted in the death of Casey Haggard, a trans woman from Fresno, California. Casey (like many trans people who are the victims of hate crimes) has still not received justice, her murderer has still not been found. On August 12th, Trans-E-Motion will be hosting a March and Vigil in remembrance of Casey. We will march down the street that Casey last walked down before her life was senselessly cut short. 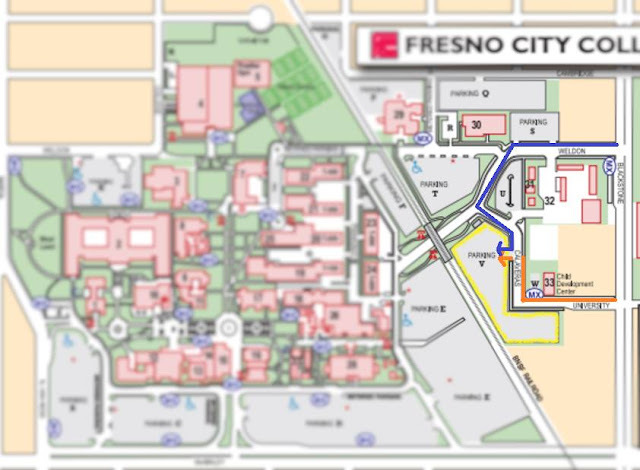 We will meet at Fresno City College parking lot V (refer to map) at 8pm. We will march down Blackstone until we reach the spot where Casey died at Blackstone and Cornell. At the parking lot/sidewalk area of 3004 N. Blackstone (at Cornell and Blackstone) we will have a moment of silence, followed by speakers. We will then March back to the starting point at Blackstone and Weldon. Please feel free to bring flowers or any other items that you wish to bring to leave for Casey at the vigil. Water bottles and LED tea lights will be provided (please do not bring actual candles due to the expected weather). 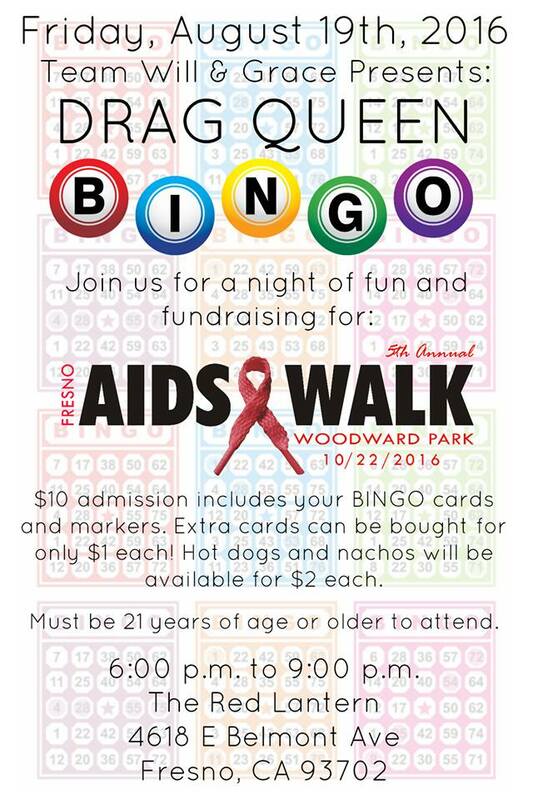 The event will be outdoors with no seating, please plan accordingly. 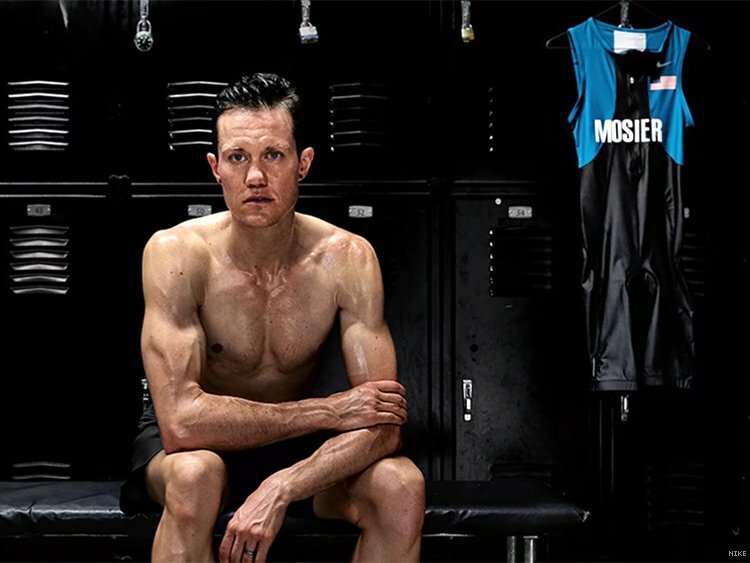 Duathalon competitor Chris Mosier keeps making history. Last year, he became the first out transgender person to be be named to Team USA, representing the U.S. at the Duathalon World Championships in Spain. This year, Mosier becomes the first trans American to compete in the Olympics. And on Monday night, in a new ad titled "Ultimate Courage," Mosier broke new ground again as the first transgender athlete in a Nike ad. The commercial features Mosier training for his grueling endurance sport, which involves biking and running. He addresses all of the challenges he's overcome to reach this incredible achievement. Mosier shared the commerical online in wonder. "When I was a kid, I dreamed I would be in a Nike commercial," he wrote on Twitter. "Your limits are only defined by you." THREE EXHIBITIONS ON VIEW AT ARTE AMÉRICAS FEATURE SOME OF THE BIGGEST NAMES IN THE INTERNATIONAL ART SCENE. In its twenty-ninth year of existence, Latino cultural center Arte Américas continues to produce exhibitions that celebrate the many ways in which culture can be manifested into an artist's brushstoke, Three exhibitions are currently on view that bring together some of the world's most respected artists into the galleries of the Downtown art-space. Over the last several years, Executive Director and Chief Curator Frank Delgado has made a ritual out of renting a cargo van and driving around the state to retrieve rare and high-level works -- many times from the studios and homes of the artists themselves. The connections that have been made in the last two years have given rare access to artists who may otherwise not be featured in Fresno. Through the direct partnership and stewardship by four highly respected Los Angeles curators Cheryl Bookout, Amanda Quinn-Olivar, Kathleen Gallegos, and Andrew Cervantes, Arte Américas was able to assemble a grouping of artists from Los Angeles who range from emerging to legendary. 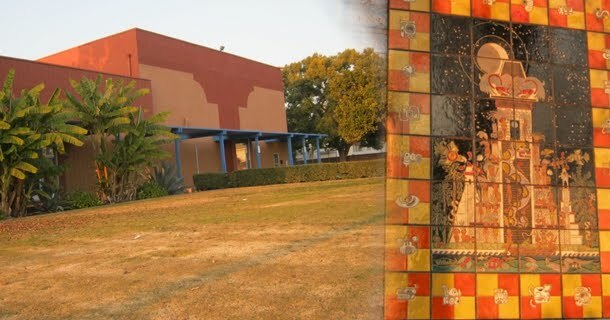 Many of the artists are Latino, but many art not -- but each are connected deeply to the Chicano and Latino communities of Los Angeles -- in an exhibition titled SOUTH OF THE GRAPEVINE. A quick glance of the walls reveals art legends Frank Romero, Gronk, Jose Ramirez, Shepard Fairey, and Vincent Valdez. Three works by Chaz Guest are currently on view, who is also showing concurrently in Paris, NYC, and in the Oval Office of the White House -- he was commissioned by President Obama to paint a portrait of Thurgood Marshall. A review of the participating artists bios would impress any art lover. "Cheryl and Amanda were the real heroes in the 'South of the Grapevine' story, as they helped to bring in some of the artists that were on my 'dream list' and were able to do so in a really short amount of time....Arte Américas is lucky to have allies like this," said Delgado. Additionally, Kathleen Gallegos of the Highland Park gallery Avenue 50 Studio was able to not only refer three additional high-caliber artists to the exhibition -- she also agreed to collaborate with Delgado to present a group show featuring Valley artists in July of 2017. "The show will be called NORTH of the Grapevine," said Delgado, "and serve as an educational counterpart to the SOUTH of the Grapevine exhibition." Up to twenty local artists will be included in the show to be presented in Los Angeles. The Community Gallery is featuring works by Francisco Toledo, considered by many to be the most significant artist currently producing works in Mexico. The traveling exhibition is titled "Fabulas de Esopo" and is based on Aesop's Fables. Toledo makes his home in Oaxaca, Mexico and has curated the show to include wall text in Spanish and the indigenous Mixteco language. In the Fresno Art Museum Partnership Gallery, Fresno artist Samantha Lazcano has unveiled a group of new works that showcase her evolving style and technique. The young artist has gone from showing at obscure Art Hop venues to participate in shows through the invitation of her highly acclaimed peers. All shows close on Sunday Aug 21. A reception for the exhibitions is scheduled for THIS SATURDAY from noon - 4pm. The program for the reception will take place at 2pm. Reception is FREE to the public. 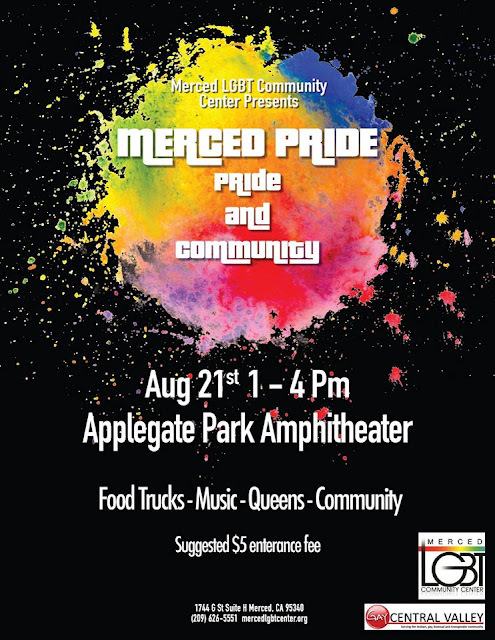 The Clovis Farmer's Market was closed last week due to heat, but the LGBT Plus tabling will happen this Friday, August 5th! MY LGBT PLUS has been invited to participate in the Old Town Clovis Farmers Market! We will be designing our booth to showcase the various LGBT+ resources the community has. Organization materials we will be bringing, besides our own, are: WestCare California, Inc., The Living Room - Fresno, The Source LGBT+ Center, Fresno LGBT Community Center, The LGBT Pink Panthers Movement/Fresno, CA Chapter, PFLAG Fresno, The Trevor Project, Reel Pride Film Festival and the Fresno AIDS Walk. 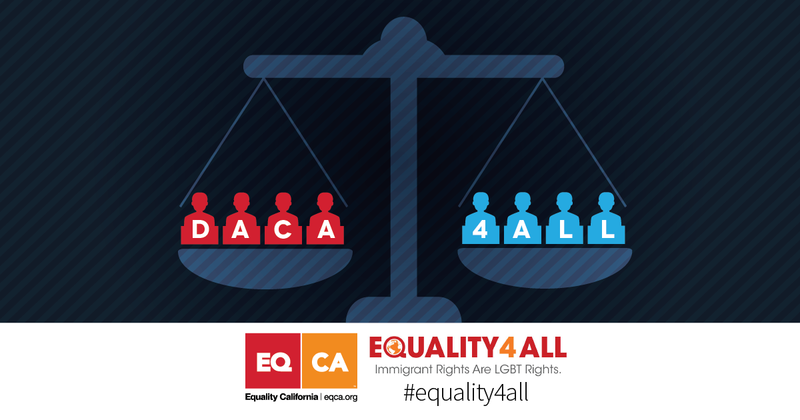 The goal is to create visibility in Clovis and provide resources to LGBT+ individuals, and supporters, in that area. Nothing will stop us from creating support in our community! Come out and join us at the Farmers Market! 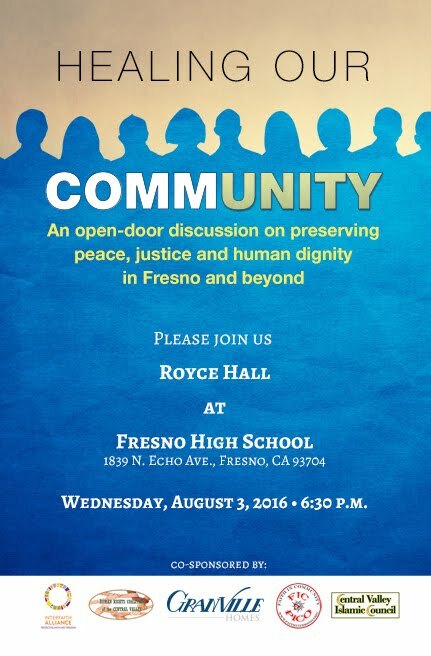 This is a free event and open to all ages. There will be other local vendors there as well. An open-door discussion on preserving peace, justice and human dignity in Fresno and beyond.